1.Raise the awareness of the problem, and the potential consequences and dangers to all road users. 2.Encourage the reporting of diesel spills so that quick remedial action can be taken. 3.Promote education at haulage companies, drivers, farmers, bus companies, petrol filling stations etc. 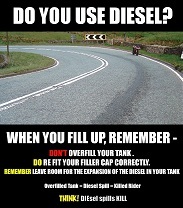 about the problems caused by overfilling, poorly fitted fuel caps and poorly maintained vehicles – all of which can lead to diesel spillage. MAG Ireland applauds the initiative taken by Mayo County Council, and we urge other local authorities to follow the example set by their colleagues in Mayo. Click here to download the poster referred to above.